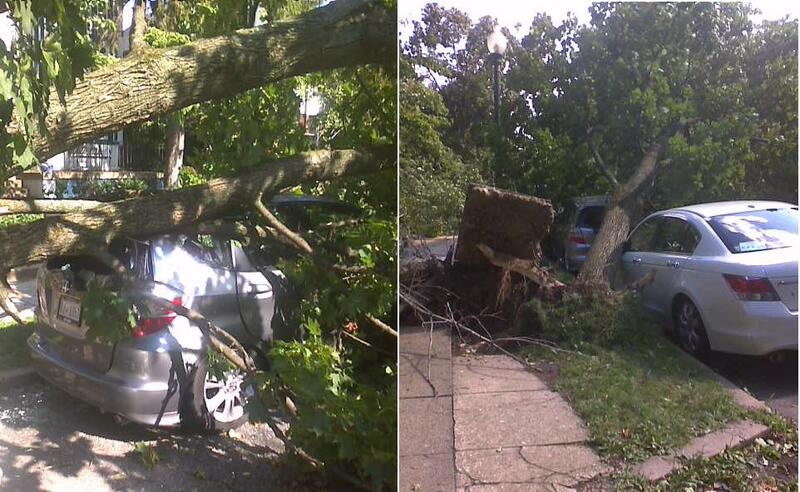 CARPE DIEM: Irene Hits Woodley Park D.C.
Damage in the neighborhood, although I think this was pretty isolated for storm damage in NW D.C. This thing was pretty tame, considering what was expected. In March 2010, Fairfield County, CT was pummeled with (largely unexpected) hurricane force winds and my neighbourhood looked like a war zone. Hardly a house without a massive tree crushing a part of it. People had no power and roads were blocked by fallen trees. We were lucky this time. Very lucky.
" "FEMA has been around since 1978, it has one of the worst reputations for a bureaucracy ever," Paul said. "It's a system of bureaucratic central economic planning, which is a policy that is deeply flawed." Paul added that FEMA is a gross distortion of the U.S. insurance system because it rewards bad behavior. "FEMA creates many of our problems because they sell the insurance because you can't buy it from a private company, which means there's a lot of danger, so we pay people to build on beaches, and then we have to go and rescue them," he said. "It's so far removed from the market and the understanding of what insurance should be about. Insurance should measure risk, it shouldn't be a a bailout program endlessly." " 'There was almost palpable disappointment among the TV big guns"
yeah.. but how does that explain all the Govs coming on and telling people to get out dodge.. shutting down the subway and threatening to turn off power...?? When all the Govs come on.. and talk about what a "dangerous" storm it is.. I'm thinking.. what are they going to be saying when a Cat 3 or 4 comes ashore? I wonder if I misunderstood the threat to turn off power... that seems not right... fridges, freezers, even sump pumps would be cut off not by storm by on purpose? He is right. Why is FEMA rewarding people with below market insurance so that they can build homes in areas where there is a great deal of danger? And why depend on a bloated and incompetent bureaucracy like FEMA when it has shown to be worthless most of the time? All one needs to evaluate FEMA is the Katrina fiasco, when private groups were prevented from helping people and supplies were sent back even though they were needed. I hope those trees fell on Defense industry lobbyists. When I lived in Florida I used to watch (with some amazement) as people parked their cars under trees immediately before a hurricane. The lack of foresight was remarkable. "When I lived in Florida I used to watch (with some amazement) as people parked their cars under trees immediately before a hurricane. The lack of foresight was remarkable." Is it possible you misunderstood their intentions? Were these nice cars or clunkers? Another Obama program Ron H, 'Trees for clunkers'? perhaps we should have a Federal program to cut down trees, eh? it would be a real stimulus and employ a lot of people.. eh? "Obama's Kickstarter Campaign to Solve the Debt"
Thanks for the link, juandos, US of R has a nice ring to it. I don't have $10bn at the moment, but printing money seems to be one of the suggestions for paying the national debt, so I'll get started right away.